Chairless Chair: Swiss startup Noonee created a wearable leg exoskeleton for sitting anywhere. Exoskeletons help people do amazing things, but a Swiss startup wants to use them for something really simple. 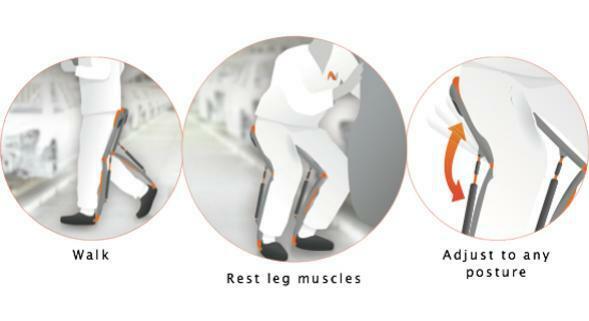 The company, Noonee, is developing a “Chairless Chair” so factory workers who have to stand all day can take a quick load off using the exoskeleton they’re casually wearing. Noonee’s design is a low-cost exoskeleton just for your legs that goes into a seated position when you push a button. When it’s not activated, you can walk or run pretty normally, but when you put it in the seated position, the aluminum and carbon fiber frame becomes rigid to support you. And the device itself only weighs about 4.5 pounds. The Chairless Chair is still a prototype, but CNN reports that Audi is planning to offer a pilot to some of its employees in September, and BMW has plans for a similar trial period. Keith Gunura, the CEO and co-founder of Noonee, told CNN, “The idea came from wanting to sit anywhere and everywhere, and from working in a U.K. packaging factory when I was 17.” The company’s CTO and co-founder Bryan Anastisiades adds that the Chairless Chair has added benefits over regular chairs because it seats people with their backs straight. It’s hard to slouch in an exoskeleton. Though we’re all trying to move around more, because of evidence that frequent prolonged sitting can cause health problems, there are so many scenarios where having a chair built into your body would be extremely convenient. The next time you’re wearing your Noonee exoskeleton and someone tells you to pop a squat, you’ll be able to pretty literally oblige.